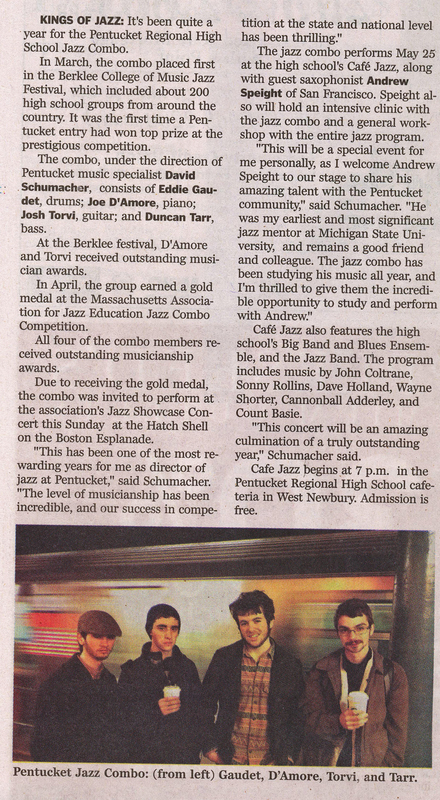 ​Congrats to the PRHS Jazz Combo for their recent 1st place finish at the 2018 Berklee Jazz Festival! Our vibraphonist, Derek Skala, was honored with the Judge's Choice Award (best in group) and the Superior Musicianship Award (given to only 1 student per division). Our guitarist Jake Baynes won an Outstanding Musicianship Award (given to only 3 students per division). Take a listen to our set HERE. Read the Daily News feature article HERE. 3Welcome to the jazz program everyone! We have 3 ensembles: Big Band, Improv Class, and our award-winning Jazz Combo. You will now receive CREDIT for your participation in the program and will be graded accordingly. Joining the program is easy, and everyone is welcome. Please EMAIL Mr. Schumacher or stop into the high school band office as soon as possible to discuss all the relevant details, including ensemble placements. No audition is required! Anyone, on any instrument, at any level, is welcome! NOTE: ALL Big Band members will have a mix of ensemble time and sectional time according to the weekly schedule linked below. BIG BAND - Students placed in the Big Band will focus on reading music, section playing, and jazz style in a mix of full ensemble and sectional rehearsal time. Improvising is optional. I strongly encourage flute and clarinet players to learn saxophone for this ensemble. "Doubling" (playing one or more woodwinds) is standard procedure for jazz players as the standard repertoire is saxophone bias, and the logistics involved with playing saxophone, clarinet, and flute overlap significantly. Since there are a limited number of positions available for rhythm section players (piano, guitar, bass, drums), an audition may be needed to determine who is accepted into the group. If this is the case, I will discuss the procedure with students directly. This will become more clear once I see how many students are interested. IMPROV CLASS - This group is for students who have clearly articulated an interest in improvisation or small group jazz playing, and who aspire to join the Jazz Combo in the future. Think of it as JV Jazz Combo! In the past I required ALL 9th graders to pass through this class on their way to Combo or Big Band, but I've found that not every student enjoys improvising. Some would prefer to sit in a section reading music instead of being spotlighted as a soloist in front of the group. Though some students will opt to join the Big Band moving forward, this group will provide a strong foundation on which students can develop their skills in any direction. This group is also open to upperclassman who want to play a secondary instrument or who want to supplement their improvisation studies. 8th graders looking for greater challenges are often invited to participate in this group. JAZZ COMBO - This group participates in festivals and competitions, and performs numerous gigs for community organizations and benefits throughout the year. All students are required to take this class for honors credit. This is the only group requiring an audition which takes place each JUNE for the upcoming year. This will involve performing and improvising on a song of your choosing. Guitar, bass, piano, and drums may have additional requirements specific to your instruments including demonstrating basslines, chord voicings. and comping. Please see me for details. Private lessons are an essential part of your growth as a musician. There are a multitude of music studio options in the area, each with particular strengths. Please allow us to offer recommendations and guide you through the process to be sure you maximize your investment. Jazz Combo gets 3rd place at the 2017 Berklee Jazz Festival! Congrats to the PRHS Jazz Combo for their recent 3rd place finish at the 2017 Berklee Jazz Festival! Our guitarist, Jake Baynes, was honored with the Judge's Choice Award (best in group) and the Outstanding Musicianship Award (given to only 3 students per division). Take a listen to our set HERE. View the full competition results HERE. Read the Daily News feature article HERE. JAzz Combo wins gold medal in state competition! I'm thrilled to announce that this past April the PRHS Jazz Combo won a GOLD medal in state jazz combo competition! This is a competition among jazz combos across Massachusetts. Outstanding Musicianship awards were given to Alden Slack, Jonathan Hayes, and Cooper Slack. Though we were invited to perform at the MAJE Jazz Showcase at the Hatch Shell on the Boston Esplanade, conflicts prevented us from accepting the invitation. Jazz Combo wins 3rd place at Berklee Jazz Festival! I'm thrilled to announce that this past weekend the PRHS Jazz Combo won 3rd place at the Berklee College of Music Jazz Festival! The Combo was moved into a tough new division this year thick with arts academies and private schools, so we are thrilled to follow our two consecutive wins with a bronze medal! The Berklee Jazz Festival is a national competition, and the largest event of its kind in the United States featuring over 200 high school combos, big bands, and jazz choirs from as far away as California, Florida, and Illinois. Thank you all for your continued support of our program, and please join me in congratulating these fine young musicians. PRHS Makes strong impact on jr. district jazz band! This was another record breaking year for the Jazz Program and specifically the Senior Jazz Combo! We sent two students to MMEA Senior District Jazz Band - Eddie Gaudet (drums) and Alden Slack (baritone saxophone) - who earned All-State recommendations in the process. Big Band member Ryan Dymek earned spots in the MMEA Senior District Concert Band, Massachusetts All-State Concert Band, and All-National Concert Band! Ryan is the first ever Pentucket student to earn this great honor. We are thrilled and super proud of Ryan! Berklee College of Music Jazz Festival WIN! 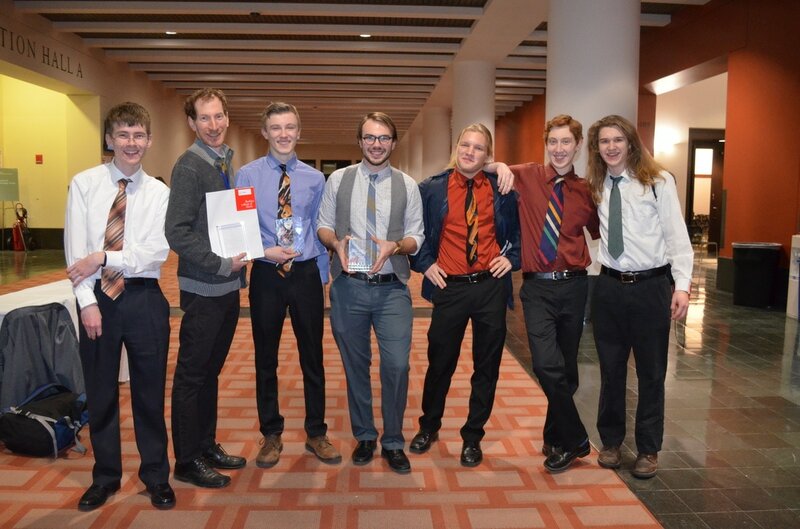 Though the Senior Jazz Combo was unable to compete in the Massachusetts Jazz Combo Festival (at which we have previously earned several Gold Medals and invitations to perform at the Hatch Shell in Boston), they did win FIRST PLACE at the prestigious Berklee College of Music Jazz Festival for the second year in a row! In the process, our group was awarded 3 of the 4 Outstanding Musicianship Awards handed out in our division. Those awards went to Josh Torvi - gtr, Eddie Gaudet - drums, and Aubrey Harris - bass. Never in my 14 years attending the Berklee Festival have I seen such a monopoly on those awards. I couldn't be more proud of this group's accomplishments! Listen to our Berklee set HERE. You will need to filter the results to hear our group. Our biggest night of the year is this Friday, May 25th 2012 at 7:00pm in the PRHS cafeteria. We feature the Blues Ensemble, PRMS Jazz Band, and the PRHS Big Band. Special guest saxophonist Andrew Speight performs with the award-winning PRHS Jazz Combo! Check out the Daily News article HERE. Gold Medal at the Massachusetts Jazz Combo Competition! Congratulations to the PRHS Jazz Combo for earning a Gold Medal at the Massachusetts Association for Jazz Education Jazz Combo Competition! This event was open to jazz combos throughout Massachusetts. In addition, ALL FOUR of our student members were recognized with Outstanding Musicianship Awards! We were the only group in the competition to earn such significant recognition. Our Gold Medal entitles us to a performance spot in the MAJE Jazz Showcase Concert at the Hatch Shell on the Boston Esplanade on May 13th. Details are forthcoming. This honor, combined with our 1st place finish on the national level at the Berklee College of Music Jazz Festival (where we also earned 2 of the 3 Outstanding Musician Awards handed out in our division), represents our most successful competition season in the 12 years the program has been in existence. 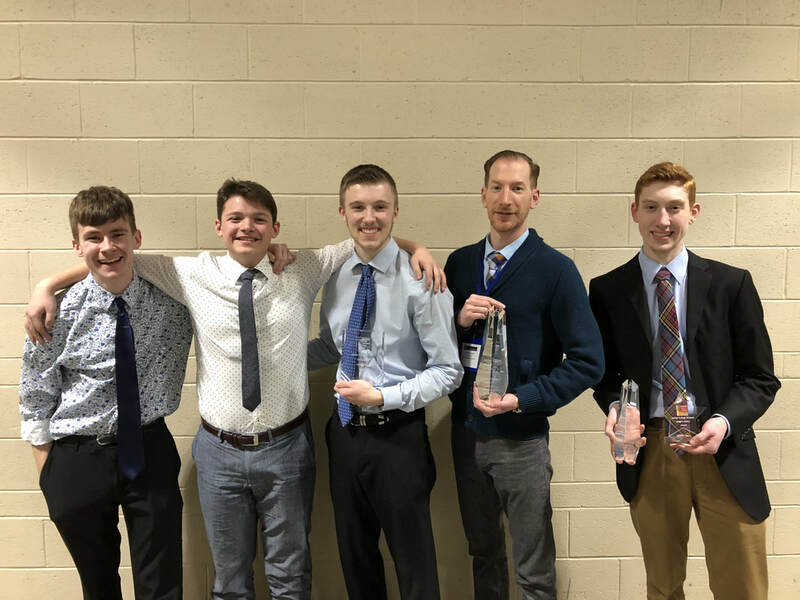 I could not be more proud to share this information and recognize Jazz Combo members: Josh Torvi - guitar, Joe D'Amore - piano, Duncan Tarr - bass, and Eddie Gaudet - drums, for their tremendous accomplishments. Listen to our MAJE set below. Listen to our Berklee set HERE. Read the Daily News article HERE and Globe North HERE. First Place at the Berklee Jazz Festival! Congratulations to the Pentucket High School Jazz Combo under the direction of David Schumacher for WINNING the Berklee College of Music High School Jazz Festival this past weekend. They were competing at the NATIONAL level against groups from throughout New England and as far away as Florida. It is the first time a group from Pentucket has earned the top prize at this prestigious competition. In addition, Joe D'Amore (piano) and Josh Torvi (guitar) earned two of the three Outstanding Musician awards handed out in our division. That is a major accomplishment for these talented students, so we offer our congratulations to Jazz Combo members: Joe D'Amore, Josh Torvi, Duncan Tarr (bass), and Eddie Gaudet (drums)! Thank you to everyone who attended our Blue Ocean fundraiser on January 29th or supported our cause in some other way. We were able to meet our goals with the event and are in good shape for our upcoming trip to NYC! Click HERE to read about us in the Boston Globe! Click HERE to read about us in the Newburyport Daily News!